When you think of one word to describe the vocal stylings of Laurie Johnson, "versatility" has got to come to mind. Whether it's the smooth sounds of a jazz standard or the poppin' licks of today's latest radio plays, Laurie nails it everytime. From Sinatra to Gaga, Laurie takes on all styles with confidence and precision. With nearly three decades in the business, Laurie knows how to read and motivate any crowd. Having performed with many bands over the years, Laurie comes armed with the knowledge and experience it takes to make any party a true success. Laurie has performed for 3 United States Presidents and played for many dignitaries over the years. She was hired by Oprah Winfrey to be part of the 75th Birthday Celebration for Maya Angelou. Here, she had the wonderful opportunity to perform with, and for, many celebrities, including, Roberta Flack, Natalie Cole, Bebe Winans, Valerie Simpson and Nick Ashford, during a 3 day gala affair, "The Mosaic of Maya" She has travelled all over the USA and abroad to perform in The Caribbean on the islands of St Kitts, Virgin Gorda, Joust Van Dyke, St Barts, Antigua, Canada, California, Florida, North Carolina, Rhode Island, Ohio and Chicago to name a few. Locally, Laurie can be seen in just about every community in the Metro Detroit area. 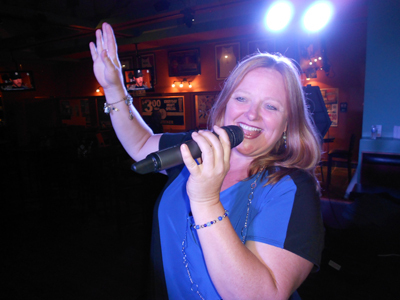 She performs regularly at Bayside in Walled Lake, and 336 Main in Plymouth. "Laurie Johnson Project", aka "LJP" which, after only a few years in existence, is enjoying the same success of many veteran groups. This, in part, is due to the many years of experience, the professionalism and the understanding it takes to produce and promote a top notch product. And having the talent to back up these claims, doesn't hurt either.